Croatian coast is adorned with as many as 101 Blue Flags! Not only the Adriatic boasts the clearest waters in the world, but official controls confirm its superb quality as well – 101 Blue Flags (international certification for ecology and environment preservation) guarantee you the greatest water quality, clean beaches, preserved nature, enjoyable surroundings and high quality service. Travelers have trust in this world famous certification and all the awarded destinations are of course very proud to have it. That's why tourists regularly decide to spend their vacations at a beach waving a Blue Flag. At Croatian part of the Adriatic you can find all types of beaches – gravel, shingle, pebble, sandy, rocky, small, big, wild or nicely arranged beaches – no matter what type you choose, you'll be welcomed with a crystal clear sea and a true Mediterranean ambiance. 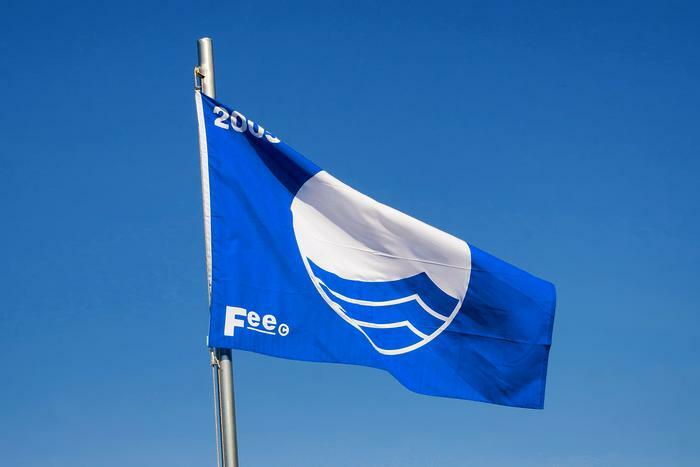 Since the certificate is given only to those locations which comply with the strictly defined criteria and is issued only on an annual basis, a Blue Flag really guarantees the actuality of qualities for every awarded beach. To ease your search for the perfect 2012 summer destination, we've singled out top 10 beaches awarded with the Blue Flag certificate. Who knows, you might find among them the one which best suits your wishes, but if you want to search more you can always check out the list of all Blue Flags along the Adriatic at the official Blue Flag website. 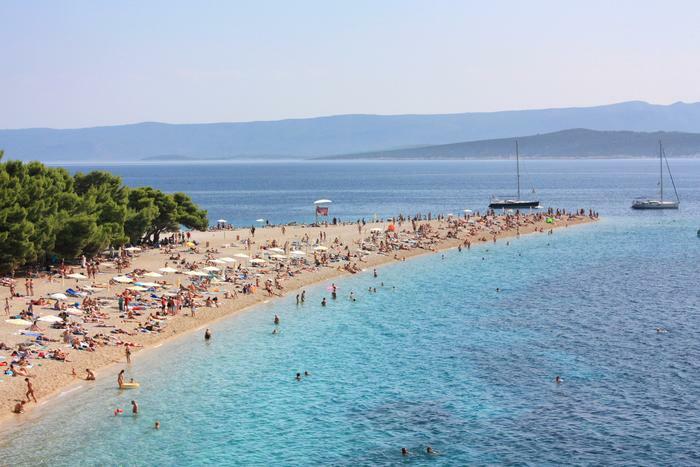 It's not clear whether the beach got its name (Plava plaža actually means 'blue beach') because of its blue sea or the Blue Flag it waves year after year. 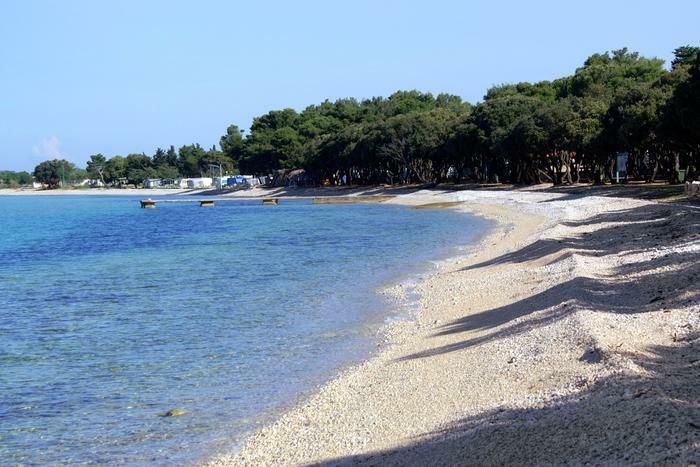 The beach has both pebbles and concrete slabs, and it's situated at the mere center of Vodice, so you can reach it pretty easily following the main, traffic closed road . Moreover, the access is adapted for people with disabilities and during the summer the beach has lifeguards. Plava plaža is also equipped with numerous sport and entertainment facilities that will make your vacation in Vodice unforgettable. Zlatni rat beach, one of the most recognizable symbols of Croatian tourism, is situated in the southern part of Brač Island. This pebble beach awarded with a Blue Flag stretches in a shape of a tongue, with its tip changing the form and direction according to wind and waves. It has no admission fee. The uniqueness of Zlatni rat has been recognized on several levels, so beside the Blue Flag, it's protected by the government of Croatia as a natural monument. 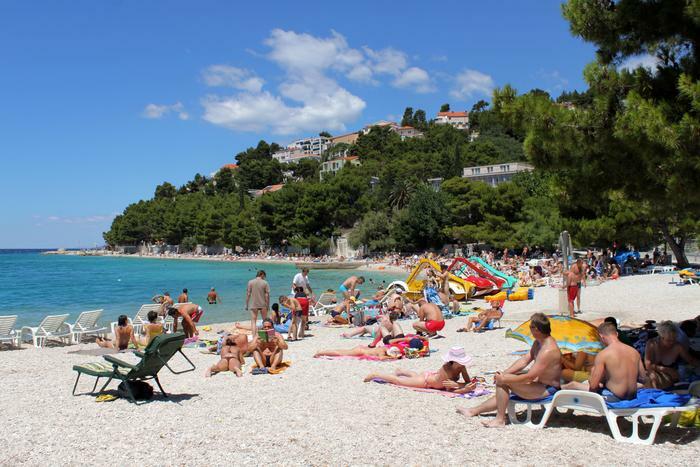 Nikolina beach is yet one more pearl of Makarska Riviera. 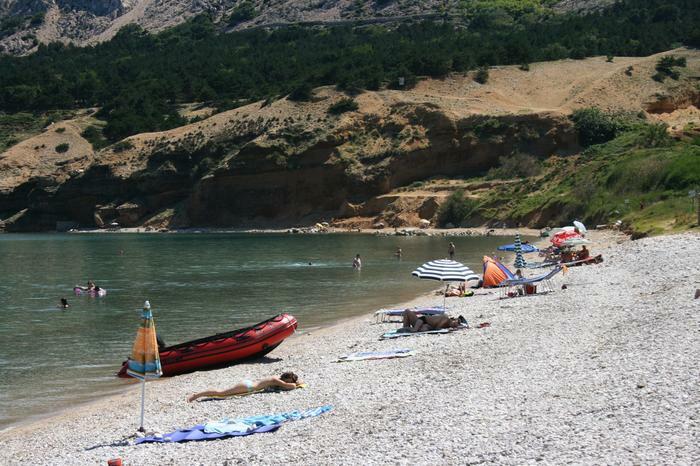 It's also the main beach in Baška Voda, spreading along a narrow seashore. It's covered with pebbles and has a good offer of beach activities, including rental of various sport and sea equipment. Combination of concrete and stone slabs, pebbles and grass can really satisfy everybody's needs. 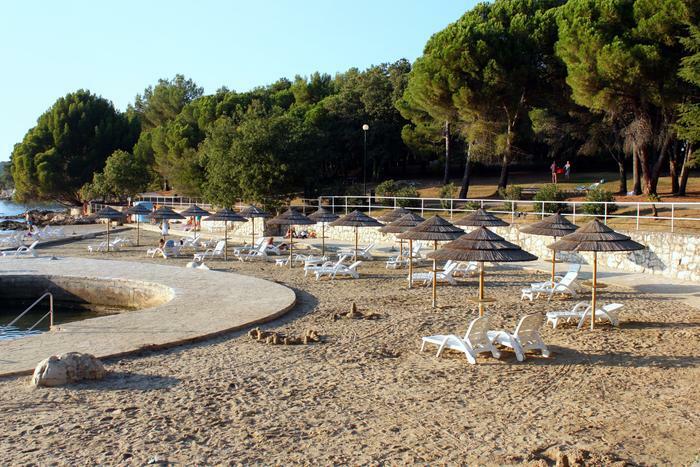 Borik beach, located just 1 km away from Zadar, has a pool and a good offer of restaurants and bars. The area around the beach is covered with pine and olive trees. Access to Borik beach is adapted for people with disabilities, and there are lifeguards from 8AM till 7PM. 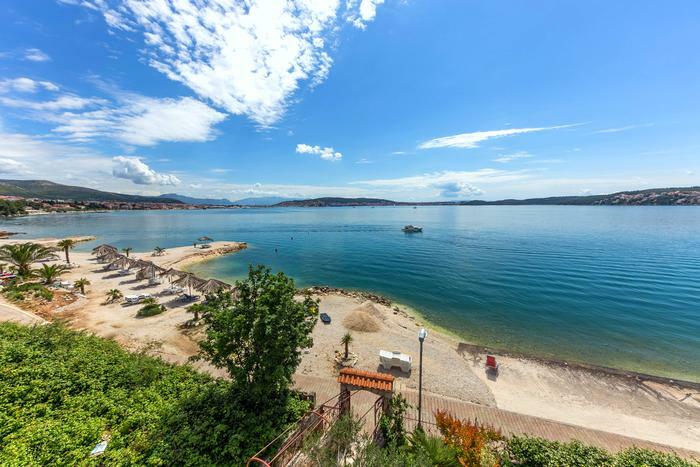 Medena beach is located only 4 km away from Trogir. It has both pebbles and sand, plus a small concrete area for sunbathing. 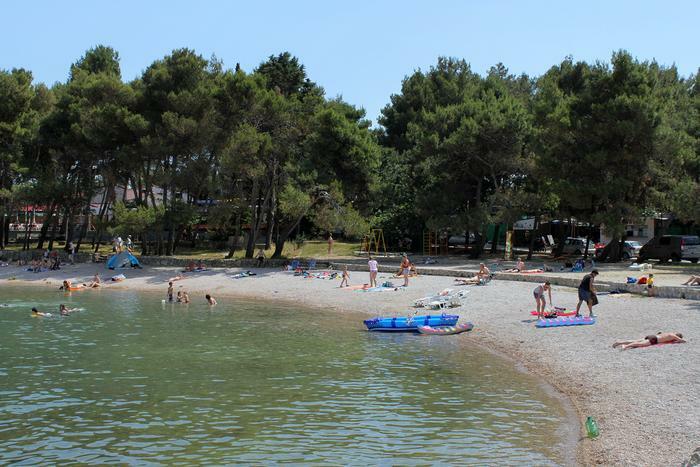 The beach is surrounded with pine-tree forest and various sport facilities: Center for Water Sports, tennis courts, football fields, basketball and beach volleyball courts, and a water slide. This rocky beach covered with pebbles is located in the southern part of the island. There's a great offer of activities in vicinity: a pool, mini-golf courses and a diving center. Part of the beach is covered with smooth pebbles, making it ideal for kids and the elders. 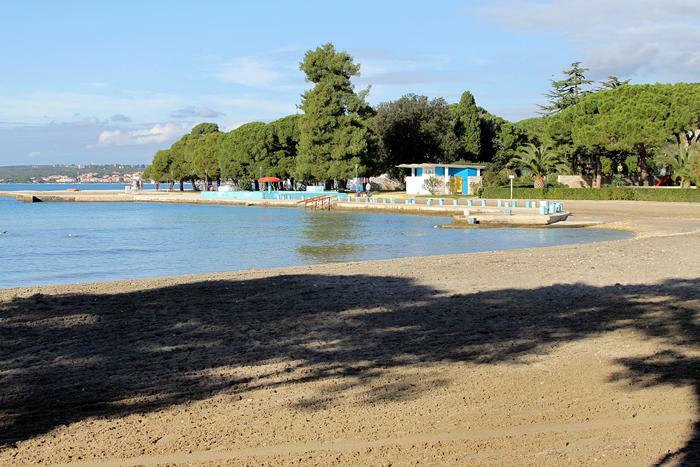 In the northern part of Poreč you'll find 300 meters long beach called Crnika. This rocky, stone beach merges perfectly with the wild surrounding environment, making it ideal for everyone seeking an escape from civilization and city hustle. There are stairs at several places on the beach which enable an easier and safer entry to the sea. Zrće beach is a long pebble beach near Novalja town. It's situated in the northeastern part of Pag Island. Due to its clubbing offer and 24/7 beach parties, Zrće is top destination for all the party-goers. This attractive city beach is partly covered with sand and partly rocky. The whole cove possesses a unique beauty – it has great offer of fun activities and it's surrounded with a pine-tree forest as well as arranged pathways. Just recently an area within the cove has been adapted and marked as a pet-friendly place. U uvali na otoku Krku proteže se duga šljunčana Vela plaža, koja je nagrađena Plavom zastavom. Na njoj će svatko naći svoj kutak za odmor ili zabavu. Neki dijelovi plaže su pješčani gdje će zabavu pronaći djeca. Mlade će privući ritmovi glazbe iz atraktivnih barova na plaži, dok su vam na raspolaganju i brojne aktivnosti na moru.